American labor leader and civil rights activist Cesar Chavez would have turned 92-years-old on Sunday. Lansing residents are honoring the activist who once brought protests to Michigan. WKAR's Reginald Hardwick reports on how Lansing residents are honoring Cesar Chavez on what would have been his 92nd birthday. On a spring day in Lansing’s Old Town, Tejano music plays at the Taqueria El Chaparrito. Chicken is grilling in the kitchen and owner Lourdes Casillas is proud that her restaurant sits along Cesar Chavez Avenue. "He was a hero... for the Hispanic people," said Casillas, who first learned about Chavez while growing up in California. "He was a leader of the workers, farm workers." Cesar Estrada Chavez was born in 1927 in Arizona. After serving in the US Navy, he formed the National Farm Workers Association. According to a University of California – Davis study, in 1960, farmworkers earned only a few dollars a day picking fruits and vegetables. According to the PBS documentary Latino Americans, it was common for children to work the fields alongside their parents. Most of the workers were Mexican-American and most died by age 49. In the 1960s Chavez and Dolores Huerta led protests to fight for better wages and conditions. From California here to Michigan, one of America’s top fruit producing states. 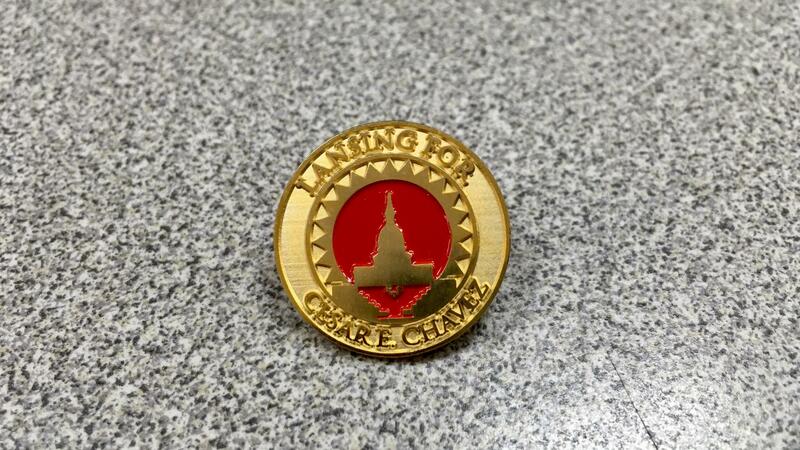 Al Salas is a store owner and chair of the Lansing for Cesar Chavez Committee. He recalls many Mexican-Americans who moved from South Texas to Lansing for work in the 1940s and 1950s. "They ended up settling here and they ended up working in the sugar beet plant," said Salas. "They ended up working in the sugar beet fields. They ended up working in the vegetable farms and the dairy farms." Guillermo Zamora Lopez is a trustee in the Lansing School District. He remembers Chavez marching down Grand Avenue and with members of Lansing’s Mexican-American community. "He comes in very humble, wearing a shirt, tennis shoes, jeans, flannel shirt," said Lopez. "That was him. He didn't put on any 'airs on' or anything." Chavez admired Gandhi and Martin Luther King, Jr.’s ideas of non-violent protests. He put his own health at risk with hunger strikes. "He was supposed to be here the following the week after his death, he was scheduled to be here in Lansing," said Lopez. Chavez died in 1993 at the age of 66. After his death, the city of Lansing had its own struggle. First, the city renamed parts of Grand Avenue after Chavez only to reverse it in 1995. Al Salas and other community leaders fought that reversal. And in January 2018, Mayor Andy Schor climbed a ladder to rename the Grand Avenue after Cesar Chavez once again. "We're to commemorate what [Chavez] stood for and that was in helping the less fortunate," said Salas. "And he was strong in education. And that your dreams can be fulfilled if you try... that anything is possible... not to give up." Salas says it gives him and many Latinos pride to drive along the avenue where his hero once marched. A documentary highlighting the life of civil rights icon Dolores Huerta premieres tomorrow on WKAR-TV. During a recent visit to East Lansing, WKAR’s Karel Vega spoke with Huerta about topics including the #MeToo movement, and what comes next in her fight for social justice. 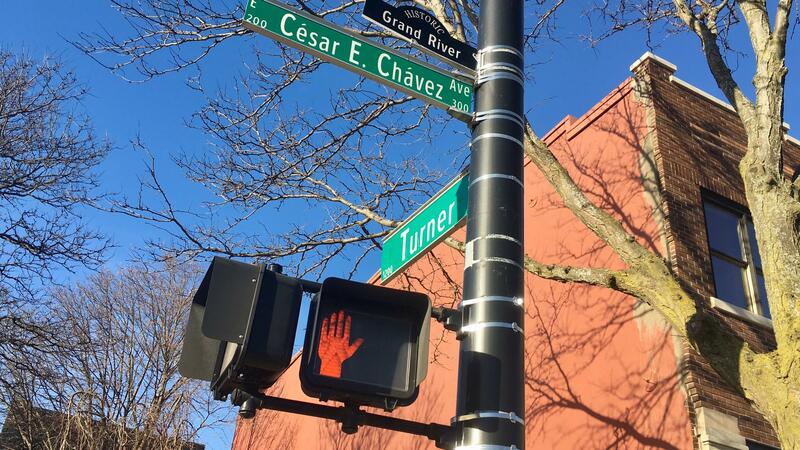 Lansing officials have planned a ceremonial unveiling of signs reflecting the renaming of a section of roadway for civil rights activist Cesar Chavez.